Sir Robert Peel - The General Screw Steam Shipping Co. Ltd.
Machinery: 40h.p. Length of engine room 16 2/10 ft. 47 3/10 tons. By J. Penn. Two cylinders 26"x26"x30" Oscillating geared. Registered: No.270 on 21st August 1849 at London. No.68 on 7th March 1850 at London. Other info: Certificate granted 7th August 1846, No335 26th September 1846. Certificate granted 21st August 1847 No.190. Designed by T. J. Ditchburn. Crew 12 men in 1849. Crew in 1850 15 men. Official No. 82. History: 1846. Built for ‘The London, Rotterdam & Harlingen Steam Schooner Shipping Company’, owned by James Laming, William Margetson and John Margetson of Mark Lane, London. 18th March 1846. Arrived in the Downs. 30th September 1846. Stephen Cook, Master. 30th September 1846. Sailed from Gravesend for Rotterdam. 10th October 1846. Outward from Gravesend with cargo for Rotterdam. 16th October 1846. Arrived at Gravesend from Rotterdam. 26th October 1846. Arrived at Gravesend from Rotterdam. 29th October 1846. Outward from Gravesend with cargo for Rotterdam. 11th November 1846. Sailed from Gravesend for Rotterdam. 16th November 1846. Arrived at Gravesend from Rotterdam. 28th November 1846. Sailed from Gravesend for Rotterdam. 11th December 1846. Sailed from Gravesend for Rotterdam. 8th January 1847. Sailed from Gravesend for Harlingen. 12th January 1847. Arrived at Gravesend from Harlingen. 16th January 1847. Sailed from Gravesend for Rotterdam. 21st March 1847. Arrived at Gravesend from Rotterdam. 23rd March 1847. Sailed from Gravesend for Rotterdam. 11th March 1847. Arrived at Gravesend from Rotterdam. 17th April 1847. Sailed from Gravesend for Rotterdam. 24th April 1847. Sailed from Gravesend for Rotterdam. 13th May 1847. Arrived at Gravesend from Rotterdam. 19th May 1847. Arrived at Gravesend from Liverpool for Antwerp. 29th May 1847. Entered outward from Custom House for Antwerp, Captain Cook. 4th June 1847. William Watts, Master. 9th June 1847. Stephen Cook, Master. 13th June 1847. Sailed from Gravesend for Harlingen. 20th June 1847. Sailed from Gravesend for Rotterdam. 8th July 1847. Arrived at Gravesend from Harlingen. 1st August 1847. Arrived at Gravesend from Harlingen. 18th August 1847. Sailed from Gravesend for Harlingen. 19th August 1847. Transferred to the ‘General Screw Steam Shipping Company’. 23rd August 1847. Arrived at Gravesend from Harlingen. 25th August 1847. Sailed from Gravesend for Harlingen. 15th September 1847. Sailed from Gravesend for Harlingen. 21st September 1847. Arrived at Gravesend from Harlingen. 21st September 1847. Sailed from Gravesend for Amsterdam. 18th October 1847. Arrived at Gravesend from Harlingen. 3rd November 1847. Sailed from Gravesend for Harlingen. 7th December 1847. Sailed from Gravesend for Rotterdam. 1st January 1848. Arrived at Gravesend from Harlingen. 5th February 1848. Arrived at Gravesend from Scheveling. 5th February 1848. Sailed from Gravesend for Rotterdam. 13th February 1848. Sailed from Gravesend for Rotterdam. 20th February 1848. Sailed from Gravesend for Harlingen. 8th March 1848. Arrived at Gravesend from Rotterdam. 14th March 1848. Arrived at Gravesend from Rotterdam. April 1848. After leaving Holland the chief mate drowned. 21st April 1848. Arrived at Gravesend from Amsterdam. 10th May 1848. Sailed from Gravesend for Leer. 24th May 1848. Sailed from Gravesend for Rotterdam. 16th July 1848. Arrived at Gravesend from Rotterdam. 26th July 1848. Sailed from Gravesend for Harlingen. 30th July 1848. Sailed from Gravesend for Valencia. 17th August 1848. Arrived at Gravesend from Rotterdam. 5th October 1848. Sailed from Gravesend for Liverpool. October 1848. Sailed from Liverpool for Constantinople and London. 28th May 1849. Entered the Tagas from Constantinople. For coals. 11th August 1849. William Watts, Master. 30th August 1849. Arrived at Gravesend from Rotterdam. 6th September 1849. Arrived at Gravesend from Rotterdam. 14th October 1849. Sailed from Gravesend for Rotterdam. 18th October 1849. Arrived at Gravesend from Rotterdam. 4th November 1849. Sailed from Gravesend for Rotterdam. 1850. On voyage London to Liverpool. Captain Watt. Owned by Mr. Laming. 10th March 1850. Sailed from Gravesend for Dunkirk. 20th March 1850. Arrived at Gravesend from Dunkirk. 24th March 1850. Sailed from Gravesend for Dunkirk. 31st March 1850. Sailed from Gravesend for Dunkirk. 3rd April 1850. Arrived at Gravesend from Dunkirk. 7th April 1850. Sailed from Gravesend for Dunkirk. 21st April 1850. Sailed from Gravesend for Dunkirk. 28th April 1850. Arrived at Gravesend from Gottenburg, then sailed for Dunkirk. 1st May 1850. Arrived at Gravesend from Dunkirk. 19th May 1850. Sailed from Gravesend for Dunkirk. 2nd June 1850. Arrived at Gravesend from Dunkirk. 30th June 1850. Arrived at Gravesend from Harlingen. 4th July 1850. Sailed from Gravesend for Dunkirk. 10th July 1850. Sailed from Gravesend for Palermo. 21st July 1850. Arrived at Gravesend from Dunkirk. 28th July 1850. Arrived at Gravesend from Dunkirk. 18th August 1850. Arrived at Gravesend from Dunkirk. 1st September 1850. Arrived at Gravesend from Dunkirk. 8th September 1850. Arrived at Gravesend from Dunkirk. 23rd October 1850. Cleared by Customs at Gravesend with cargo for Dunkirk. 21st November 1850. Sailed from Gravesend for Dunkirk. 1st December 1850. Arrived at Gravesend from Dunkirk. 15th March 1851. Sailed from Plymouth for Cape Town. Captain J. Boxer. Placed on the line as a substitute for the ‘Bosphorus’. 2nd April 1851. Arrived at Sierra Leone. 3rd April 1851. Sailed from Sierra Leone. 27th April 1851. Arrived at Cape Town at 2p.m. 2nd May 1851. Sailed from the Cape of Good Hope with 14 cabin and several steerage passengers, and a full cargo. 10th June 1851. Arrived at Plymouth. Made her first trip to the Cape and back in a most creditable manner, and, it is hoped she will do so again; but her tonnage is too small for such a distant voyage, and it is hoped the appearance of a more powerful steamer to take her place. 15th July 1851. Sailed from Plymouth for Cape Town at 2 a.m. Captain J. Boxer. She had a full cargo of British manufactured goods, and several passengers. 27th July 1851. Arrived at St.Vincent. 29th July 1851. Sailed from St. Vincent. 4th August 1851. 15 miles from Sierra Leone River, vessel under ordinary steam, one of the brasses of the main Plummer block was unexpectedly injured, by which the spur-wheel was broken and the main-shaft bent. Steam was immediately blown off, a wooden bearing applied to the defective part. 5th August 1851. Arrived at Sierra Leone. There was no place to work, so the engineers started to repair the machinery. 6th August 1851. Her Majesty’s steam-vessel ‘Electra’ arrived at Sierra Leone and offered to cast new brasses. This was unsuccessful. 16th August 1851. The ‘Hellespont’ arrived at Sierra Leone and repaired the old brasses. Mr. Finlay, the engineer of the ‘Hellespont’, had his left foot crushed while walking on the engine platform of the ‘Sir Robert Peel’, to observe her progress after repair; his leg was amputated under the joint superintendence of the surgeons of the ‘Electra’, ‘Hellespont’ and ‘Sir Robert Peel’. 25th August 1851. Due to non-arrival, and owing to important despatches the steamer ‘Birkenhead’ will sail from Simon’s Bay for England. 28th August 1851. 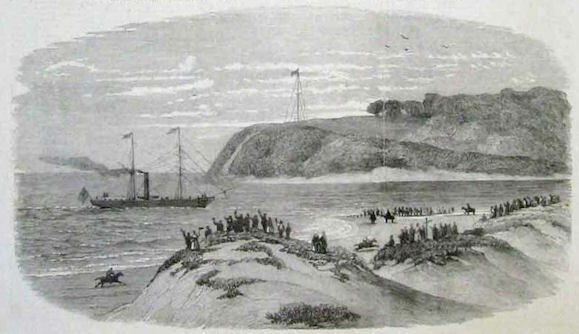 Sailed from Sierra Leona for the Cape where new brasses were obtained. 15th September 1851. Arrived at Cape Town. 24th September 1851. Sailed from Cape Town. 14th October 1851. Touched at Sierra Leone. 20th October 1851. Arrived at St. Vincent. 22nd October 1851. Sailed from St. Vincent. 7th November 1851. Arrived at Plymouth. She has a general cargo of wines, etc., from the Cape, including some almonds, being the first importation from that colony, and a small quantity of gold from Sierra Leone. Delayed at Freetown. 8th April 1852. Arrived at Gravesend from Dunkirk. 1st May 1852. Sailed from Plymouth to the Cape of Good Hope and Port Natal for service between the two ports. 12thJune 1852. Sailed from Plymouth for Cape Town. Captain J. Boxer. 30th July 1852. Arrived at Table Bay at 15.00hrs. 5th August 1852. Sailed for Natal from Table Bay to start Natal – Cape Town branch line. 13th August 1852. Anchored in the outer Bay of Durban. 16th August 1852. Arrived at Natal. 21st August 1852. Sailed from Natal and called into Algoa Bay. She had no difficulty in passing the bar. She was the first steamer to enter the bay. 28th August 1852. Arrived at Cape Town. Having returned from the first trip to Natal she brought down samples of sugar grown there, and put up in bags of native manufacture; it is pronounced to be of first-rate quality. Cane-planting was being commenced on a large scale. 2nd September 1852. Sailed from Cape Town. 10th September 1852. Arrived at Natal. 18th September 1852. Sailed from Natal. 23rd September 1852. Arrived at Cape Town. 30th September 1852. Sailed from Cape Town. 7th October 1852. Arrived at Natal. 12th October 1852. Sailed from Natal. 14th October 1852. Sailed from East London. 15th October 1852. Sailed from Algoa Bay. 16th October 1852. Sailed from Mossel Bay. 19th October 1852. Arrived at Cape Town. 27th October 1852. Sailed from Cape Town. 6th November 1852. Arrived at Natal. 13th November 1852. Sailed from Natal. Immediately she had crossed the bar she broke her crankshaft and required several days work back at Mr. Cato’s workshop. 21st November 1852. Arrived at Cape Town. 28th November 1852. Sailed from Cape Town. 10th December 1852. Arrived at Natal. 15th December 1852. Sailed from Natal. 17th December 1852. Arrived at East London. 18th December 1852. Arrived at Mossel Bay. 21st December 1852. Arrived at Cape Town with seventy passengers. Needed slight repairs done. 19th January 1853. Sailed from Cape Town. 29th January 1853. Arrived at Natal. 6th February 1853. Sailed from Natal. 8th February 1853. Arrived at East London. 10th February 1853. Arrived at Algoa Bay. 13th February 1853. Arrived at Cape Town with sixty passengers and a full cargo. 12th March 1853. Sailed from Cape Town, after being detained waiting of the English Mail. She has a full cargo, with a full complement of passengers, and has been ready for sea some days. 16th March 1853. Arrived at Algoa Bay. 22nd March 1853. Arrived at Natal. 2nd April 1853. Sailed from Natal after being delayed for six days for repairs for a leak. 8th April 1853. Arrived at Cape Town. 12th April 1853. Sailed from Cape Town. 19th April 1853. Arrived at Natal. 11th May 1853. Sailed from Natal after further repairs. 12th May 1853. Arrived at East London. 14th May 1853. Arrived at Algoa Bay. 17th May 1853. Arrived at Cape Town. 23rd May 1853. Sailed from Cape Town. 29th May 1853. Arrived at Natal. 5th June 1853. Sailed from Natal. 7th June 1853. Arrived at East London. 9th June 1853. Arrived at Algoa Bay. 12th June 1853. Arrived at Cape Town. Captain Boxer. 24th June 1853. Sailed from Cape Town. 2nd July 1853. Arrived at Natal. 5th July 1853. Sailed from Natal. 7th July 1853. Arrived at East London. 8th July 1853. Arrived at Algoa Bay. 10th July 1853. Arrived at Mossel Bay. 13th July 1853. Arrived at Cape Town. 2nd August 1853. Went out and towed the ‘Propontis’ into Table Bay as she had run out of fuel. 4th August 1853. Sailed from Cape Town. 12th August 1853. Arrived at Natal. 14th August 1853. Sailed from Natal. 16th August 1853. Arrived at East London. 17th August 1853. Arrived at Algoa Bay. 19th August 1853. Arrived at Mossel Bay. 20th August 1853. Arrived at the Cape of Good Hope from Natal and transferred her passengers onto the 'Indiana', just as she was getting up steam to leave. 24th August 1853. Sailed from Cape Town. 12th September 1853. Arrived at Natal. 14th September 1853. Sailed from Natal. 22nd September 1853. Arrived at Cape Town. 28th September 1853. The ‘Queen of the South’ put into Saldanba Bay, being short of coal. The ‘Sir Robert Peel’ was immediately dispatched to the Bay with the requisite supply of fuel. 30th September 1853. Captain Boxer being indisposed, the chief officer took command on the next trip to Natal. 4th October 1853. Sailed from Cape Town with 120 passengers. 14th October 1853. Arrived at Natal. 17th October 1853. Sailed from Natal. 19th October 1853. Arrived at East London. 22nd October 1853. Arrived at Algoa Bay. 23rd October 1853. Arrived at Mossel Bay. 25th October 1853. Arrived at Cape Town. 30th October 1853. Sailed from Cape Town. 8th November 1853. Arrived at Natal. 12th November 1853. Sailed from Natal. 22nd November 1853. Arrived at Cape Town. 1st December 1853. Sailed from Cape Town. 6th December 1853. Arrived at Algoa Bay having during her passage encountered severe south-east gales. It was expected she would leave on the following day for Natal. 10th December 1853. Arrived at Natal. 13th December 1853. Sailed from Natal. 23rd December 1853. Near at Cape Town, met up with the ‘Propontis’ at sea and handed over the mails. 24th December 1853. Arrived at Cape Town in a disabled state, her machinery being completely disordered. After leaving Algoa Bay, she had proceeded to port entirely under canvas. This steamer, which has made fifteen voyages from the Cape to Natal, will now be detained for some time, having to undergo extensive repairs in connection with her machinery. The ‘Natal’ is shortly expected. 5th January 1854. At the Cape of Good Hope. January/February 1854. Her machinery being repaired at Cape Town. 3rd March 1854. Sailed from Cape Town. 16th March 1854. Arrived at Natal. 22nd March 1854. Sailed from Natal. 30th March 1854. Arrived at Cape Town. 15th April 1854. Sailed from Cape Town. 25th April 1854. Arrived at Natal. 7th May 1854. Sailed from Natal. 20th May 1854. Arrived at Cape Town. May/June 1854. Put on shore in Simon’s Bay to have her propeller unshipped, her boilers re-fitted, and the necessary repairs to her machinery. The work was undertaken by Mr. Combrink Jun. Mr. Combrink, sen. having in hand the repairs in Table Bay. 13th July 1854. The 'Cape of Good Hope' sailed from Southampton to relieve the 'Sir Robert Peel' on the service between Graham's-town, Port Natal, and New London. 20th October 1854. Left Simon’s Bay, but in a few hours a defect was discovered in her machinery, and she put back again. 29th October 1854. Been in Simon’s Bay for repair and sailed for Cape Town. 5th November 1854. Sailed from Cape Town for England with her machinery still imperfect, under Captain H. B. Benson. Captain Boxer transferred to the ‘Natal’. 9th January 1855. Arrived at Southampton from the Cape of Good Hope. She is expected to return to her London trade. 3rd March 1855. Put into dry dock for a week. 16th March 1855. Sailed from Southampton for London to convey the British contributions to the French Exhibition. 29th March 1855. Arrived at Gravesend from Dunkirk. 27th April 1855. Arrived at Gravesend from Dunkirk. 13th May 1855. Arrived at Gravesend from Dunkirk. 20th July 1855. Sailed from Gravesend for Dunkirk. 4th August 1855. Sailed from Gravesend for Dunkirk. 22nd September 1855. Arrived at Malta with stores from London. 27th October 1856. Sailed from Gravesend for Harlingen. 25th July 1856. At Southampton no longer used as a Government Transport. Waiting for re-employment. 2nd November 1856. Sailed from Gravesend for Rotterdam. 5th November 1856. Just off Liverpool. 7th November 1856. Arrived at Gravesend from Rotterdam. 27th May 1857. Arrived at Gravesend from Dunkirk. 14th July 1857. Arrived at Gravesend from Dunkirk. 14th July 1857. Sailed from Gravesend for Dunkirk. 25th July 1857. Arrived at Gravesend from Dunkirk. 25th October 1857. Sailed from Gravesend for Dunkirk. 20th December 1857. Arrived at Gravesend from Dunkirk. 31st January 1858. Sailed from Gravesend for Dunkirk. 30th March 1858. Sailed from Gravesend for Dunkirk. 17th May 1858. Sailed from Gravesend for Dunkirk. 25th July 1858. Sailed from Gravesend for Dunkirk. 4th August 1858. Sailed from Gravesend for Dunkirk. 13th August 1858. Sailed from Gravesend for Dunkirk. 1st September 1858. Sailed from Gravesend for Dunkirk. 4th September 1858. Arrived at Gravesend from Dunkirk. 24th September 1858. Sailed from Gravesend for Dunkirk. 6th January 1859. Arrived at Gravesend from Dunkirk. 10th January 1859. Sailed from Gravesend for Dunkirk. 17th January 1859. Sailed from Gravesend for Dunkirk. 20th March 1859. Arrived at Gravesend from Dunkirk. 22nd March 1859. Arrived at Gravesend from Dunkirk. 15th June 1859. Sailed from Gravesend for Dunkirk. 29th June 1859. Sailed from Gravesend for Dunkirk. 11th December 1859. Sailed from Gravesend for Dunkirk. 8th January 1860. Sailed from Gravesend for Dunkirk. 29th February 1860. Sailed from Gravesend for Dunkirk. 29th April 1860. Sailed from Gravesend for Dunkirk. 13th May 1860. Sailed from Gravesend for Dunkirk. 26th May 1860. Arrived at Gravesend from Dunkirk. 27th July 1860. Sailed from Gravesend for Dunkirk. 5th April 1862. Sailed from Gravesend for Dunkirk. 23rd December 1862. Arrived at Gravesend from Dunkirk. 19th November 1863. Arrived at Gravesend from Dunkirk. 24th August 1864. Passed Deal from Scilly for Norway. 21st June 1867. Arrived at Gravesend from Dunkirk. 20th August 1868. In collision in the harbour of Dunkirk with the steamship ‘Pfeil’. 5th February 1870. Sailed from Gravesend for Dunkirk. 19th February 1870. Arrived at Gravesend from Dunkirk. 9th June 1870. Sailed from Gravesend for Dunkirk. 9th August 1870. Arrived at London Bridge from Dunkirk. Boiler explosion, Stoker killed. 1870. Re-registered to W. J. & E. F. Carey, London. New Boilers fitted. 28th August 1871. Arrived at Gravesend from Dunkirk. 1872. Registered to Edward Fricker Carey of 34 Mark Lane, London. 22nd October 1872. Arrived at Gravesend from Dunkirk.